Lt. Stephen Harrell, 44, liked to sing. One dream he nurtured was to have one of the songs he wrote professionally recorded. He was a natural musician who could play half-a-dozen instruments. Along with this brother Harvey, Lt. Harrell was one of the two sets of FDNY brothers who died at the Trade Center. His painting lists him in Battalion 7. He was covering in Ladder 10 on 9/11 and was one of the very first to respond. Accounts place Harrell in the center staircase of Tower One, somewhere between the 30th and 40th floors. He left behind a 7-year-old daughter. 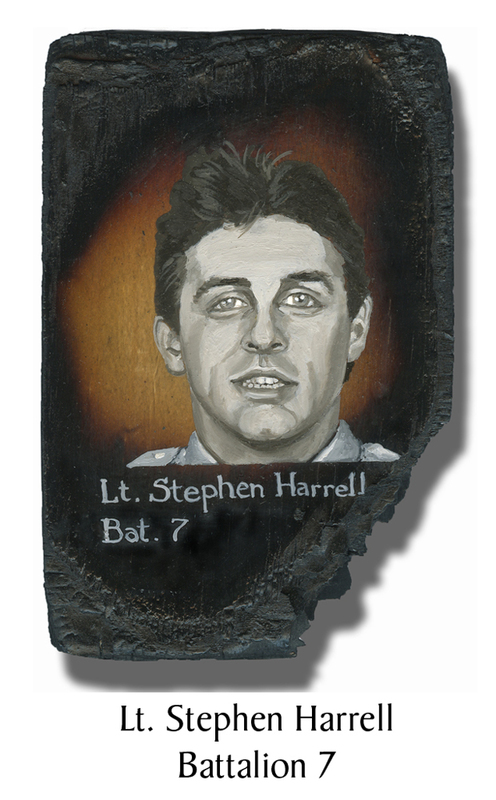 This entry was posted in Better Angels Stories and tagged 343, 9/11, better angels, Dawn Siebel, FDNY, firefighter, firefighters, firefighters of 9/11, Ladder Co. 10, LODD, Lt. Stephen Harrell, memorial, NFFF, paintings, World Trade Center, WTC. Bookmark the permalink.